This blog is a consideration of the fact that ‘mad’ might be a very apt term after all! Mad – when you find your self dressed in oversized, second hand, blokes’ sallopets and wooly bonnet, painting in an unheated studio, with the door open for ventilation and a hot water bottle strapped to you, when it is minus 2 outside and blowing a gale. Mad – when in those said conditions you are painting a herd of zebras in the warmest colours you can find for an exhibition straight after Xmas in Lanark, and realising that the painting will never dry in time. Mad – when you are wishing Xmas could be cancelled so you could get on with painting and then realise that you painted right through Xmas for the last few years anyway. Mad – When you would rather paint than do anything else, but every painting is a giant struggle to achieve. Mad – when your dog plonks her ball on your paint table and between brush strokes you throw it out through said open door to keep her amused, over and over and over again. Mad – that the dog loves it when you paint as she finds distracting you a very good game indeed. Mad – When the electrics in your studio are not working so mid winter Scotland you are working in the near dark, trying to catch the last rays of light before night falls at the ridiculously early 3.30pm, and then feel frustrated for the rest of the evening as it is over 16 hours before the sun rises again. Mad – when you wake at 4 am, think bugger – still 5 hours before daylight, might as well write a blog about art in the meantime. Mad – when you have long since run out of wall space in your own house, and can barely swing a cat for finished paintings and painted furniture, but rather than focus on selling you just want to paint more, as the next one will be THE good one! Mad – to live in the middle of absolutely bloody nowhere and be a self employed artist. Great for the peace to get on with it, terrible for the scarcity of folk and general total lack of social life. Urban self gone missing! 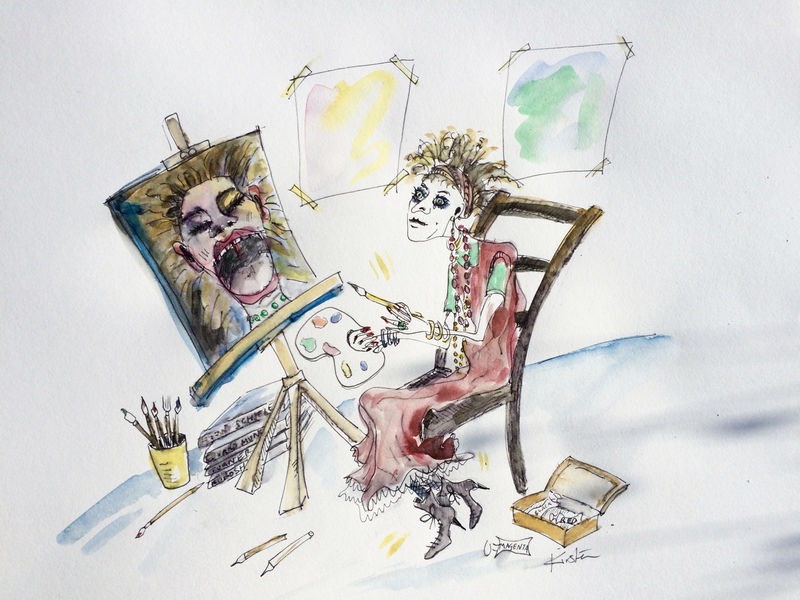 Mad – that despite that you realise that being a somewhat reclusive artist might be who you really are! Mad – to rather buy art materials than clothes or have a holiday. Nothing makes you happier than to buy white paper, clean canvas, tubes of oil paint and new brushes. Mad – the price of aforementioned paper, canvas, oil paint and decent brushes! Mad – to be the great ruiner of brushes! Mad – because it’s only 4.15 am and not daylight for another 4 hours at least! Mad – because due to freezing studio conditions over last 3 days, your back is feeling somewhat tight and you have a bit of a chill, but you can’t wait to get back out there and try to resolve the massive painting you have started! Mad – to start a massive oil painting in the first place when you could sit in the warm house and draw. Time for a another coffee and to do some drawing until dawn ….